Cursive at The Slowdown, Oct. 28, 2012. 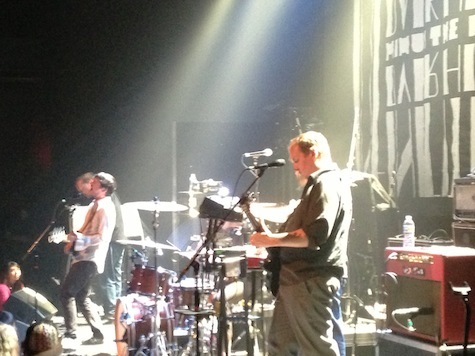 Last night’s Cursive show at The Slowdown was the tightest, strongest set I’ve seen the band play. I credit weeks and weeks and weeks on the road (with more weeks to come). Has Cursive ever toured an album this hard? Probably. Is it paying off? I honestly don’t know. From all the reviews I’ve seen online, they’ve consistently drawn sizable crowds, like last night’s, which wasn’t a sell out but must have been darn close. I have no idea how well I Am Gemini has sold. In this Spotify era, no one (especially indie bands) has any expectations about record sales. 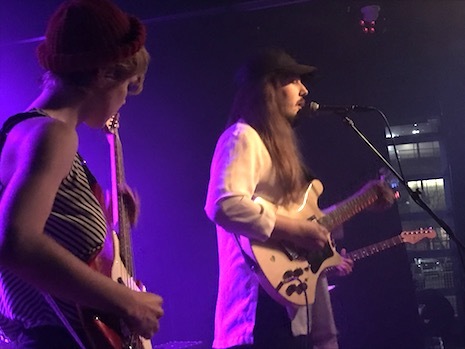 The band (performing as a five-piece) went on stage at around 9 p.m. and proceeded to jump right into their set, stringing song after song reaching back to Domestica and including a couple off the new record. When I Am Gemini came out at the beginning of the year, I had slight doubts that it would fit in with the rest of the Cursive oeuvre. Those doubts were erased last night, as the band seamlessly slipped in tunes “This House Alive” and “The Sun and Moon” among classics like “The Radiator Hums” and “Art Is Hard” as if they were just two more greatest hits. I couldn’t help but think how broad Cursive’s catalog has become. Kasher’s prolific songwriting is ominous, with seven full lengths to choose from spanning over a 15-year career (not to mention all those Cursive EPs and singles, along with four more LPs as The Good Life and his recent solo material). Since their set was an opener for Minus the Bear, they kept it to a tight 45 minutes, closing out with “Dorothy at Forty,” and then abruptly leaving the stage — no encore. Even Kasher’s between-song patter was kept to a minimum, leaving only room to tell the audience to keep Nebraska’s Democratic spot alive next week. And, he confessed that he was a “Mother’s Milk guy.” Unfortunately no one from the RHCP was there to appreciate the comment. 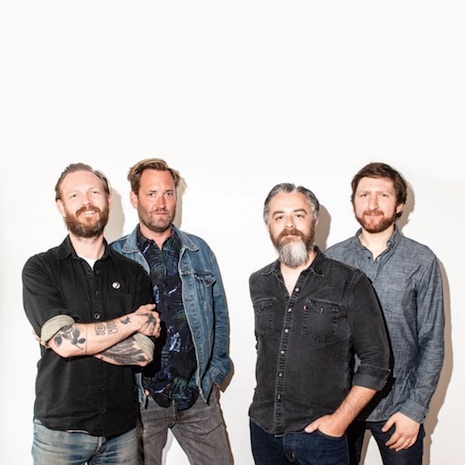 I stuck around for only a handful of Minus the Bear songs. They sounded slightly more mainstream (and accessible) then I remember them being all those years ago. I feared they might get “Omaha’d” last night, but that clearly wasn’t the case. Speaking of songwriting, Kasher talks about the process in this rather interesting Q&A at playbackstl.com. Check it out. Tonight at The Waiting Room it’s Athens band The Whigs (ATO Records). Opening is local guys Lonely Estates. $10 (a steal! ), 9 p.m. Meanwhile, down at Slowdown Jr., it’s Polyvinyl Records band Stagnant Pools with Kite Pilot. $8 (cheap! ), 9 p.m.